Is This Uptown's Craziest Apartment? Way back in 2004, Columbia University bought 53 apartments in the struggling new development 455 Central Park West, but they didn't get their hands on this one. And thank the good lord for that, because then we wouldn't be staring at the bonkers interior shots seen above. They come from inside the old French Renaissance chateau that was the city's first cancer hospital and later a "scandal-plagued nursing home" according to the NYT. That chateau is attached to a 26-story tower, and together they make up 455 CPW up on 106th Street in Manhattan Valley. 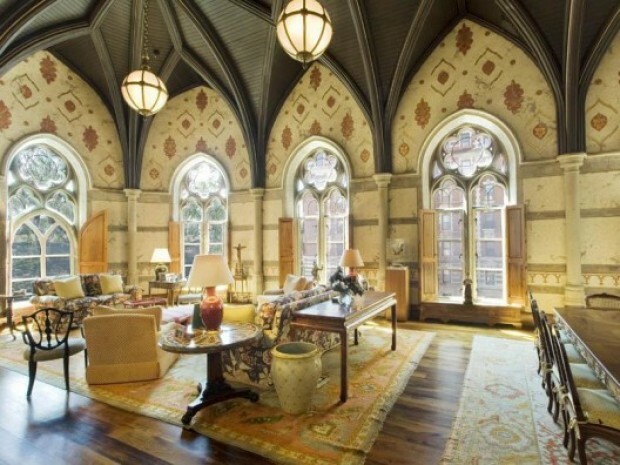 This former 19th Century Chapel has been converted to one of the single greatest private residences in Manhattan. 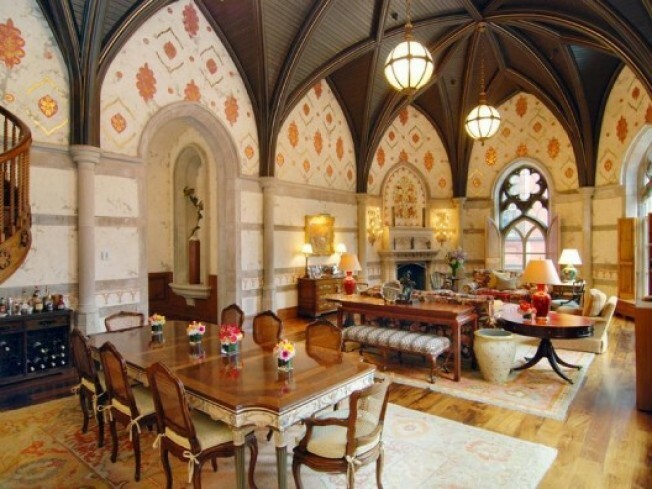 An official Landmark, this imposing neo-French Renaissance Chateauesque style Prewar Condominium features; Park views, interior private elevator, Chapel Great Room with Vaulted Ceiling and Peaked Chapel Windows. Mezzanine Library and Balcony Sitting Room. Separate 1-bedroom staff apartment. Architectural elements include stone columns, arched Gallery, Paneled rooms, antique French stone floors, gold-leafed and plaster walls. A unique synthesis of historical stylistic references blended with a 21st Century modern contemporary lifestyle, provides for a once in a lifetime opportunity. And yes, folks, it's available fully furnished. So is $12.5 million finally the right price for such an esoteric piece of property? For an answer, we recommend staring deep into that wallpaper until the secret messages are revealed.